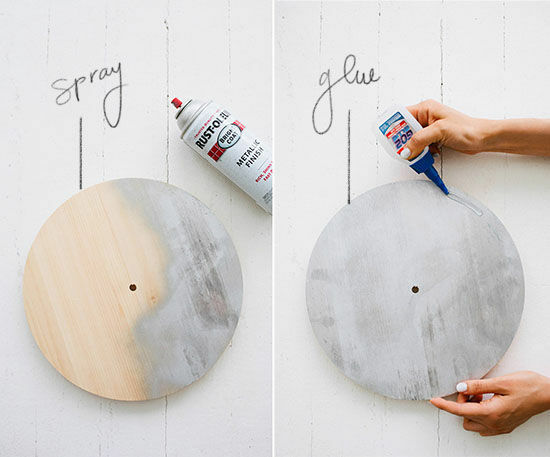 • Spray paint both sides of clock face. The back of the clock face will be the front of the mirror. 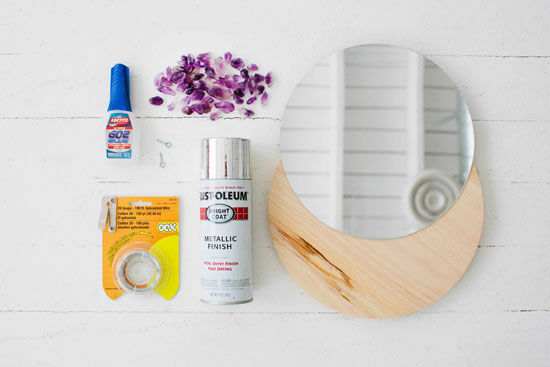 • Glue mirror to clock face and press surfaces together. Allow to set for 30 minutes. 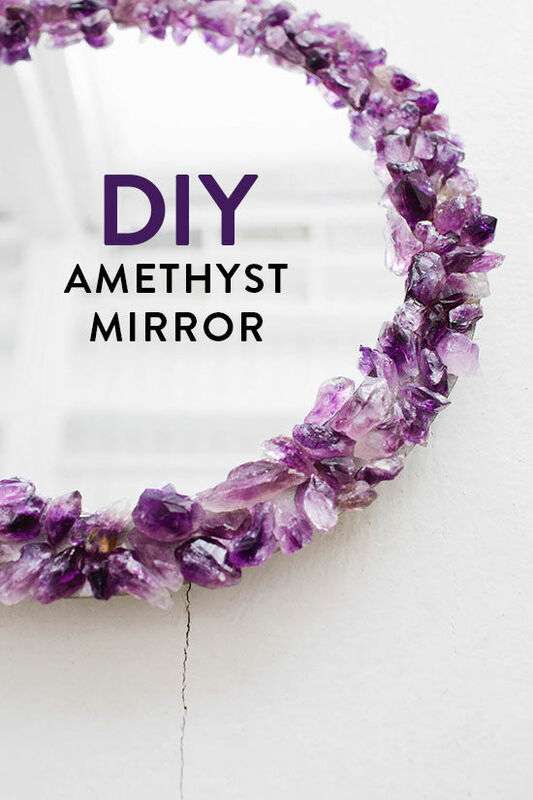 • Using a generous amount of glue, attach crystal pieces around the border of the mirror, with some overlapping the mirror edge to conceal it. Let the glue cure overnight. 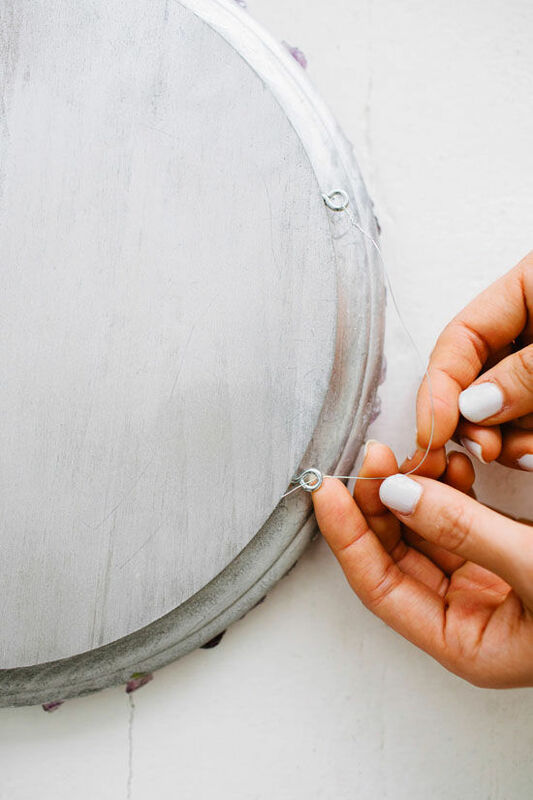 • Thread wire through eye hooks and twist to tighten so that the wire is taut and not visible from the front. and there you have it, simple and so pretty! i think this mirror would make the best gift for those hard to buy for friends. i know i sure wouldn’t mind receiving one! what do ya think? so lovely dlf! great etsy source. I had a question about the amount of crystals you used because I want to make this as a wedding gift for a friend. Did you end up using all 200 crystals? Or do you think 100 would be enough? I don’t want to skimp, but I also don’t want to order more than I really need. Thanks so much! i totally thought those were petals! certainly makes for a unique mirror. I am obsessed with crystals. I have actually started making prayer candles with small pieces of fluorite in them because they are known for helping with so many things – prioritizing, calming, focus, honing intuition, etc. Love this mirror! I’ve been super into rose quartz lately!! It has the prettiest, softest pink color–I can’t get enough!! 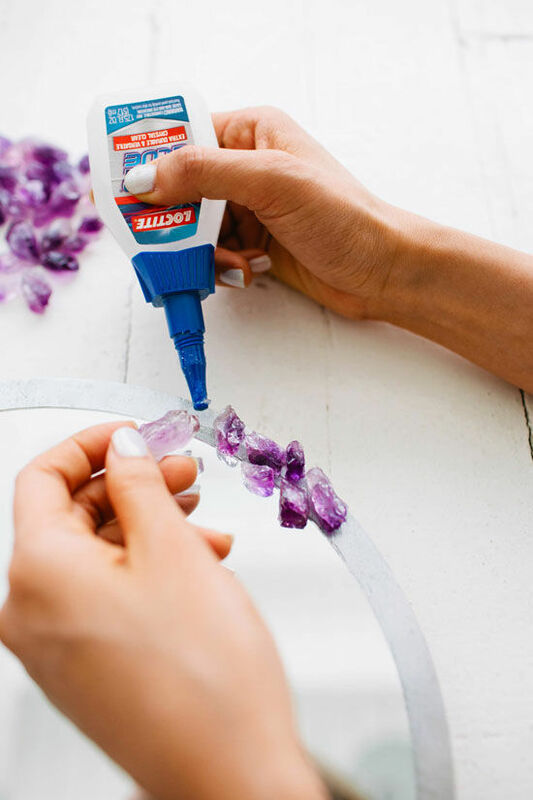 This seems like a great diy to add to my rose quartz collection. Thanks! This is the best diy this year so far! It looks so pretty and you can decorate it so many ways. Thanks for sharing this one! Sooooo beautiful! AwEsome! Thx for sharing bri! This is gorgeous! I love it! Purple is my favorite color! That glue is pretty awesome by the way! I use it for my crafts as well! This is lovely! I love how the light makes the crystals shine. I love how customizable this is. You could mix different tones of the same color crystal and it would look awesome too! love crystals so much… keep me away from rock shops! this turned out *so* beautifully. love love love! this is stunning. this looks so so pretty! What a BEAUTIFUL mirror! This is most definitely a DIY I want to try! Also looks lovely against the white brick. Awesome idea and amazing result!! This is so amazing.. I think I already pin this DIY on my pinterest, and try to make my own when I redecorate my room ASAP. Thank you for share.. I am obsessed with crystals, they’re so beautiful and each one is unique. 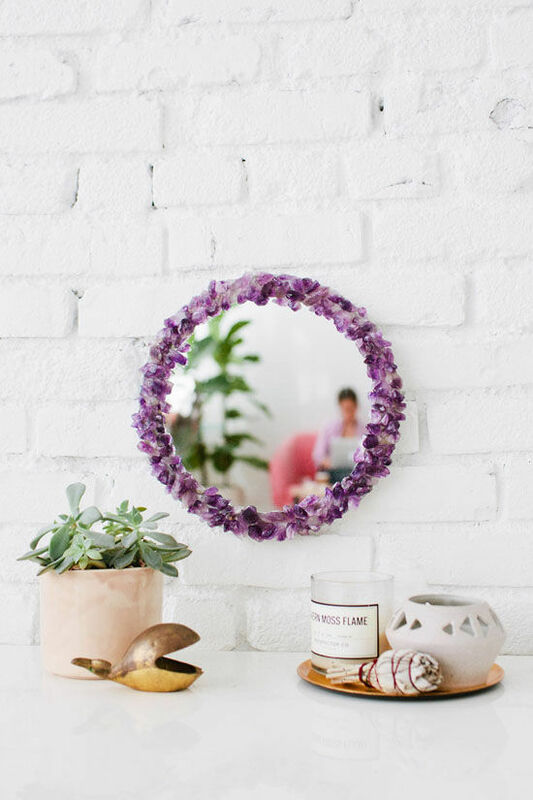 This is the first DIY Mirror I have seen that someone actually put a bigger wood circle behind it to add the border, everyone else just puts it on the actual mirror. Love it! Featured your tutorial in an article on my handmade blog. Hope you don’t mind the bloglove! I absolutely love this project idea!! 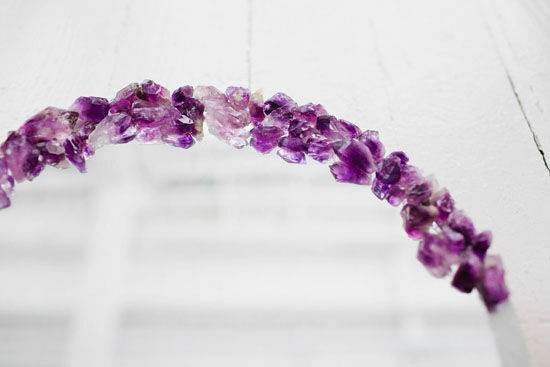 My boyfriend is a geologist, so a gemstone mirror would actually be really fitting for our home. Thanks for the how-to!! Love this! And really love that brass whale in the 2nd to the last photo. Can you please tell me where you got it? thanks. I like the way you explained everything in your blog and I want to tell you that all of your methods are very easy to follow. Hello! I featured your mirror in my monthly blog series, Get Your Color On!. Each month I select a color, provide tips on how to decorate with it, and feature other bloggers with their projects that relate to this color. This month’s post is all about purple, so your project was perfect! Feel free to grab a featured button and check out my post at Get Your Color On! Purple. Thanks for sharing your wonderful creativity! Yes, please tell us where we could find such a cute lil whale, ceramic, metal or otherwise. I`d like to know about the whale too. Right here is the right web site for anybody who wishes to find out about this topic. a new spin on a subject that’s been written about for decades. hi Jennifer! I know this is super late but I was able to get by with 150 crystals! So that will save you a little bit! 🙂 You can get roughly 150 by ordering the 1/2 lb. and the 1/4 lb. Good luck! OH I am IN LOVE. I have so many friends who would love this! And thank you for the info on the Amethyst! Every other place I have tried to find have always been too expensive. Absolutely adore this! I have all my supplies now & should receive my amethyst in the mail within a few short days. I cannot wait to have mine happily hanging on the wall. 🙂 Thanks for such a great tutorial! So lovely! Also… what’s the whale-like thing on the counter?? Too cute! 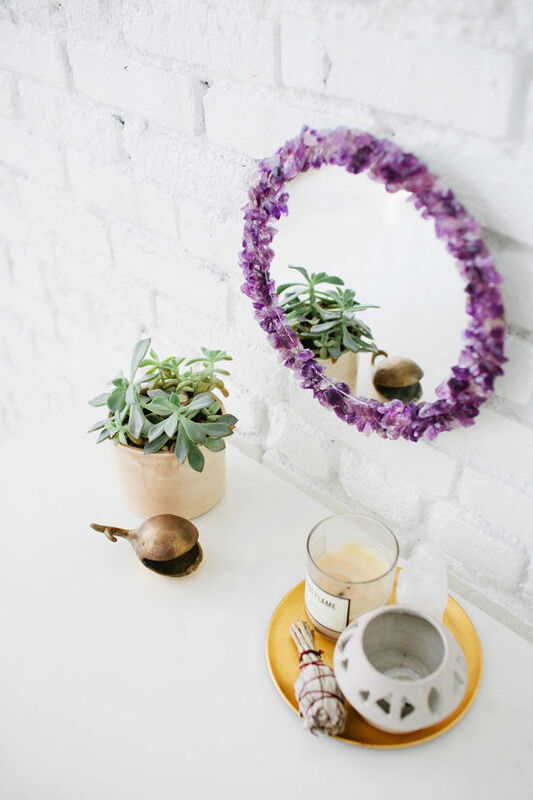 Love this diy mirror it’s so cute! I was wondering if you could put a direct link to where you got these I can’t seem to find the exact ones you have. Thanks so much! 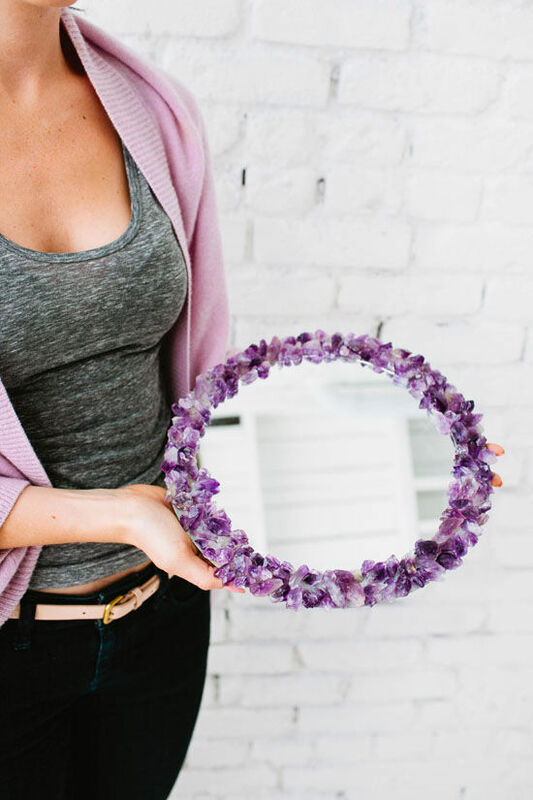 Those amethyst crystals really make this mirror look so special. Lovely. Where can I purchase the clock face?